The Columbia-Snake River Irrigators Association has been asking good questions for years, sometimes leading to improvements in state water policy. The group recently asked Northwest governors to launch a little-used clause in the Endangered Species Act that could force the federal government to recognize improvements to salmon and steelhead populations in the Columbia and Snake rivers. The so-called "God Squad" review by an Endangered Species Act committee could conclude that reasonable mitigation already has been completed, and it could exempt the rivers from any more mitigation, according to a letter that irrigators sent last week to the governors of Washington, Oregon, Idaho and Montana. A few years ago, the group was asking why farmers should be punished for reducing their water consumption. Farmers who had been conserving water for years wanted to know why water they've saved couldn't go toward irrigating more land. Under the state's antiquated "use it or lose it" water policy, conservation efforts just meant a farmer's water allotment would eventually be cut to match the reduced use. But existing law allows farms to use saved water in their allotment on new acreage, said Darryll Olsen, board representative for the irrigators association. About 5,000 additional acres in the Columbia Basin are being irrigated using water farmers have conserved from existing allotments. So far, questioning the "use it or lose it" policy has had good results -- bringing more land into production without increasing allotments from the river. If the irrigators succeed in getting one of the region's governors to call for a God Squad, the result could be big savings for ratepayers in the region with no harm to fish. The Bonneville Power Administration and environmentalists are locked in a seemingly endless legal battle over the agency's plans for mitigating the effect of federal dams on endangered salmon and steelhead. Every time the government creates a mitigation plan, call a biological opinion, or BiOp, it's immediately challenged by one or more environmental groups. The result, Olsen said, is an escalating series of new, more expensive plans. BPA now spends about $900 million a year to mitigate the dams' effect on fish and wildlife. That cost is passed on to ratepayers. But it's never enough to prevent the next lawsuit. Last month, the environmental group Earthjustice filed a 90-day notice of its intent to sue over the latest BiOp. It's a great idea to stop the cycle. Fish counts confirm the success of efforts to help fish navigate federal dams. About 227,000 spring Chinook are expected this year in the upper Columbia -- above the Bonneville Dam -- doubling the 123,000 that returned in 2013, officials said. 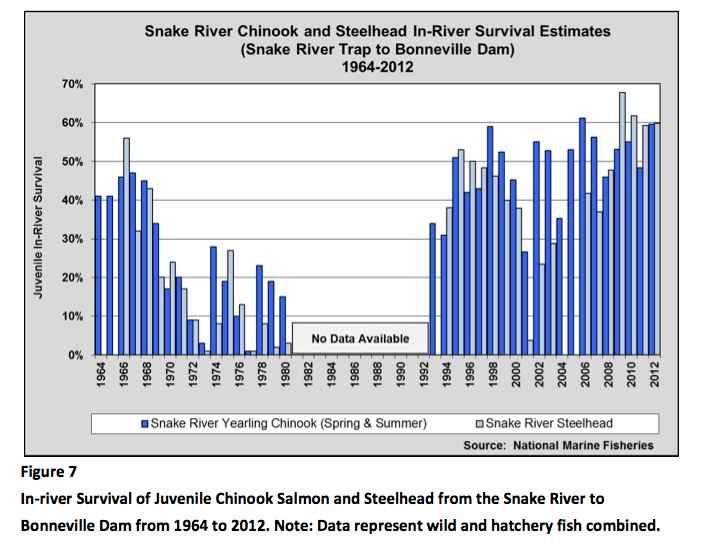 The largest increase is expected in the Snake River, where 125,000 marked Chinook are forecast, up from 67,000 last year. Summer Chinook returns are expected to be flat, but upriver, bright fall Chinook are expected to increase to more than 973,000. Last year, 784,100 fall upriver bright Chinook returned, which was above the forecast of 432,500. The God Squad would have the power to exempt the rivers from any more mitigation and to decide whether reasonable mitigation already had been done, the irrigators association wrote to the governors. Such a review could stop "excessive and unbridled litigation directed toward the region's electric power ratepayers," the letter said. A God Squad review is clearly justified by the expense to taxpayers of additional mitigation and evidence that efforts are already working. The $900 million a year that ratepayers are already spending will bring additional improvements in salmon returns without additional litigation. More lawsuits are costly and not needed. Let's try to end the cycle.